the innovative products. Its structure mainly by the hydraulic motor (low speed or high-speed motor), hydraulic multi-plate brake normally closed, planetary gear box, clutch (optional), reel, support shaft, rack, rope pressure device (optional), etc. Composition. Hydraulic motors with high mechanical efficiency, Starting torque big, May be required under the conditions of the assignment with different devices, This series of winches have a compact in structure, small size, light weight, beautiful appearance, In performance is good, while in safe, high efficiency, starting torque, low-speed stability is good, the noise is small, reliable operation and so on. 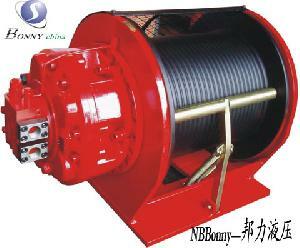 Since the series of winches have the above advantages, It is widely used in ships, railway, engineering machinery, petroleum, geological exploration, and metallurgical industries, Its excellent performance of the user's approval.